This is another one of my Cinderella dishes! It's the perfect frugal recipe for transforming all your leftover food into something gorgeous. 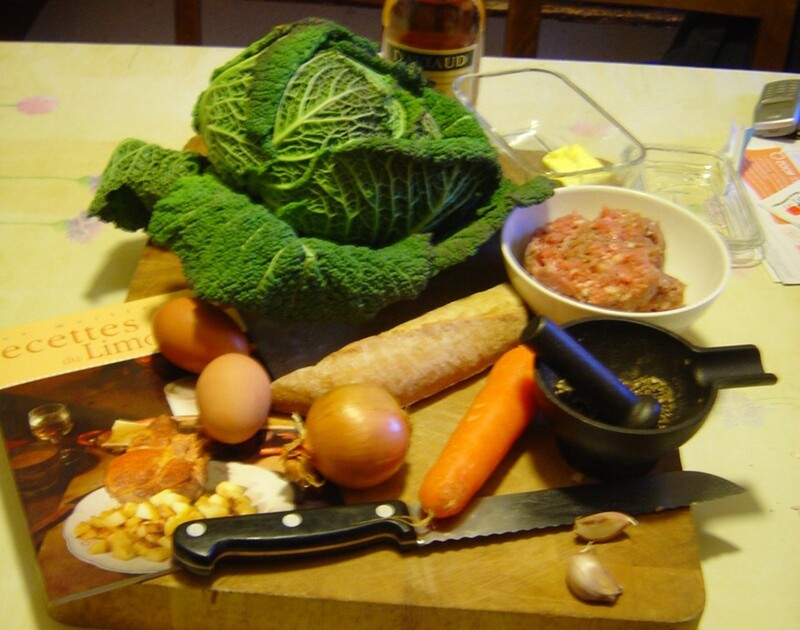 Stuffed cabbage is one of many such recipes from Limousin, the rural heart of France. This is a farming area, and it was once very poor. 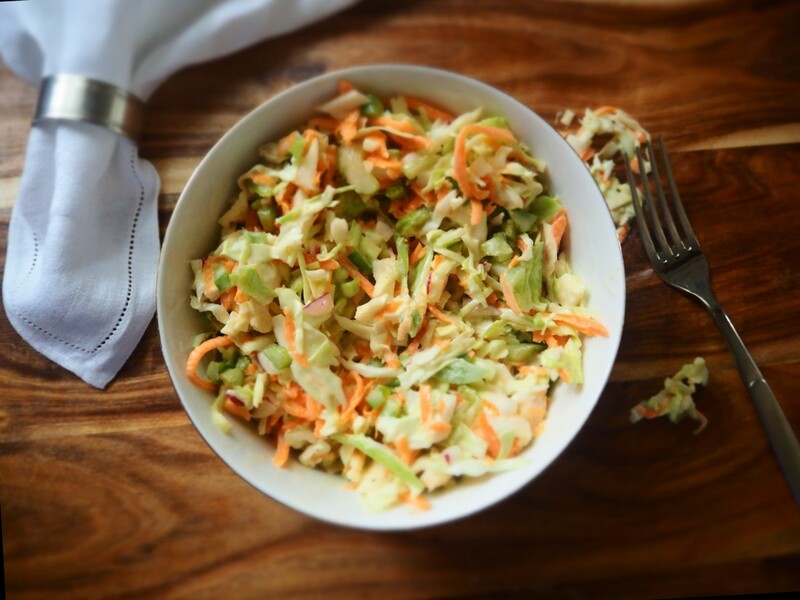 Stale bread, chestnuts, and cabbage often feature as cooking ingredients in this area's cuisine, and this cabbage recipe features all three! 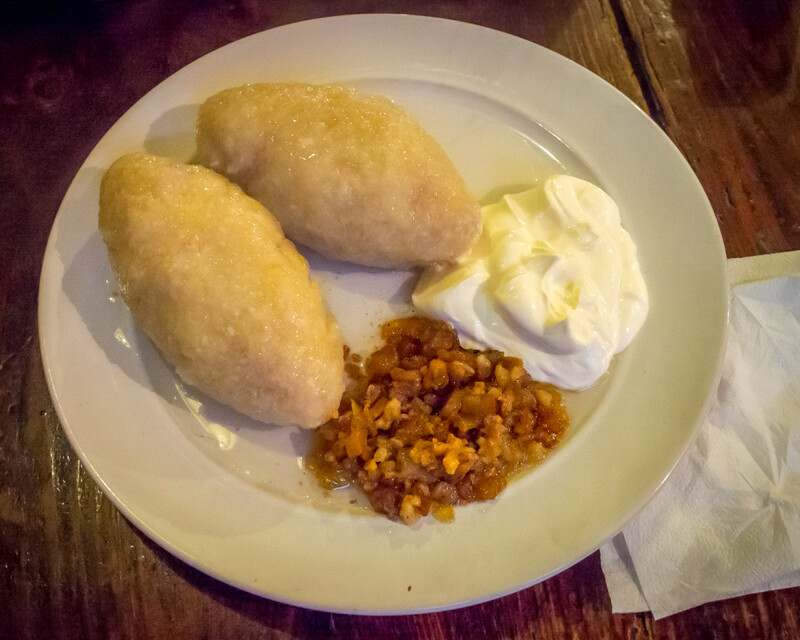 I've really enjoyed eating them in the local restaurants and Videix annual fete, and then making them for myself as well. I just adore the idea of changing base materials into gold, and that is exactly what this cabbage recipe does. 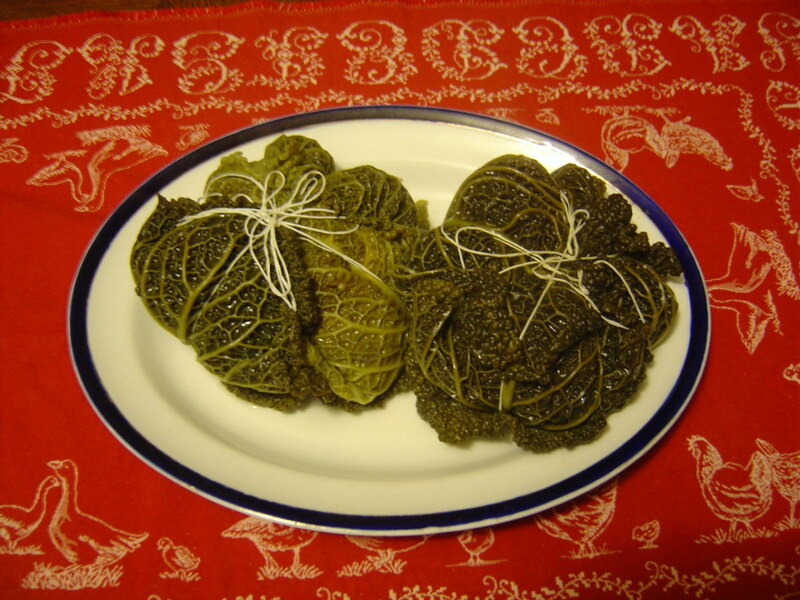 If you look up recipes for traditional French stuffed cabbage, you'll find they vary quite a bit, and my main recipe comes from an older local resident of Videix; the one who makes the stuffed cabbages for one of our annual communal meals (read on for more about these!). There are three or four elements that are common to all the recipes: Cabbage - of course -, moistened stale bread and sausage meat. I reckon that you could produce this dish using only these ingredients. In addition to these, my mentor added milk, eggs, onionsherbs and seasoning. Other recipes suggest chestnuts, a local staple as we are surrounded by woodlands composed of sweet chestnut and oak trees), carrots and tomatoes. It is obvious where this has come from. 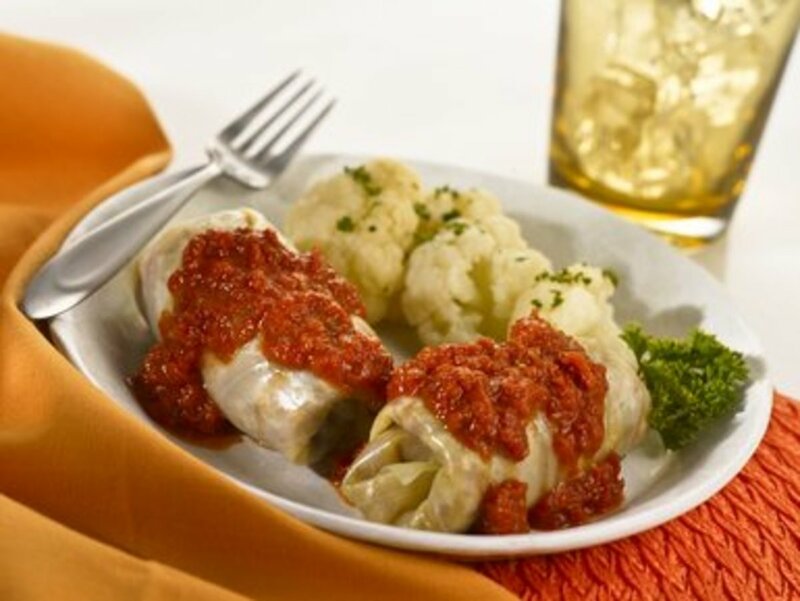 Stuffed cabbage would have been a way to use up your left-overs, so I suggest that you do the same. If you have a few assorted veg, chuck them in. Also I haven't included qualities. I bought a cabbage and a hand full of meat and just added to that. 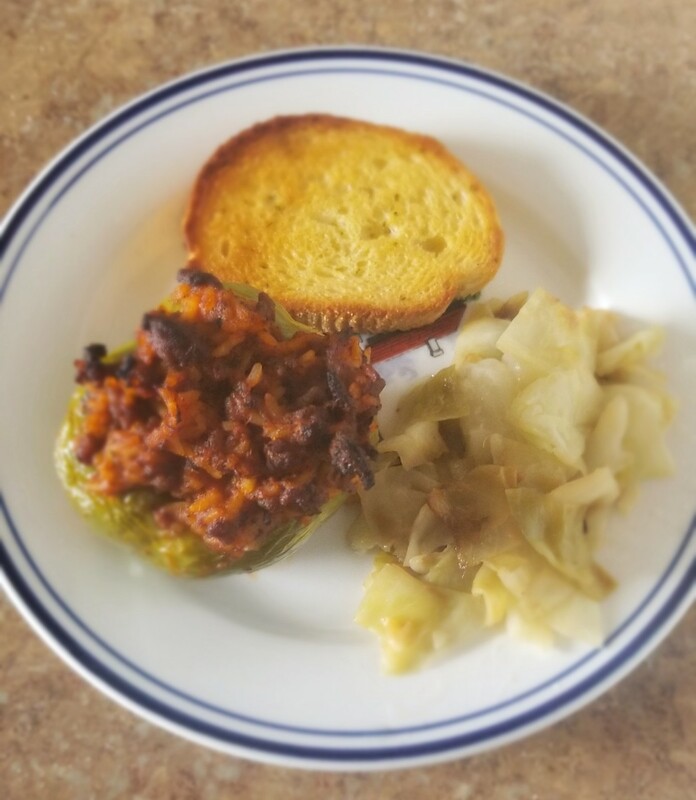 Mine turned out to be a bit mean for two packages, so I've increased the ingredients a bit for you, but you'll have left over cabbage, just dice it and add it to the mix or cook it separately and serve as a vegetable. Traditional recipes ask for lard and include quite a lot of fat, but I more or less missed this out thinking the sausage meat would have enough fat in it for today's lifestyles. You can add a knob of butter if you like. Also, some suggest you add brandy and the like. I do think that as this was a 'peasant' dish, I wouldn't pollute it with posh ingredients. Why should you when it is so delicious anyway? If you have filling left over, make it into a beef burger shape, flour it and fry it as a rissole. Waste not want not! I asked for 'une poignée' a hand full, of sausage meat. Fortunately it was the butcher's hand and not mine. I think that was about right. I used about a third of a baguette of bread, perhaps about the same quantity of bread as meat. Dice this and soak in milk. You could also use stock instead to moisten the bread. Herbs. I used dried thyme but wish that I'd thought of getting some sage and parsely from the garden! You'll also need cooking twine, the string they use to truss chickens. 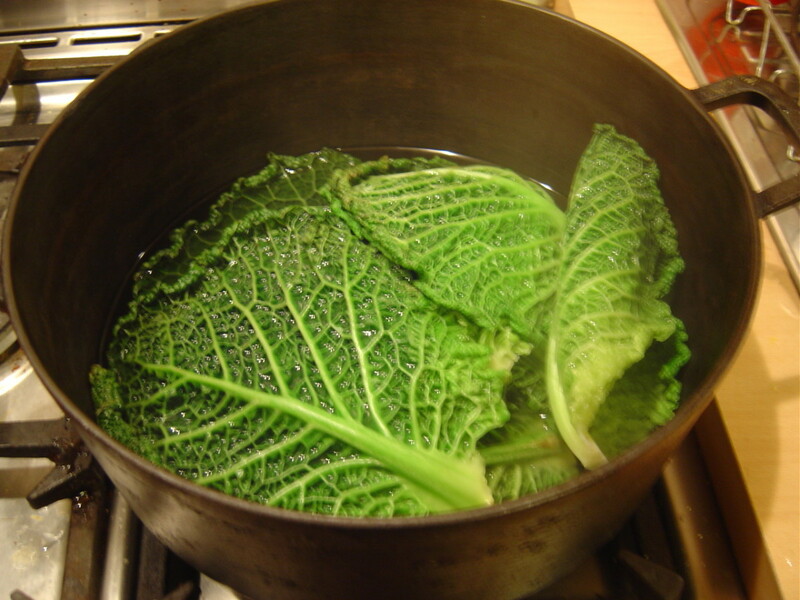 Take the leaves off the cabbage, wash and boil in salted water for 5 - 10 minutes until softened. Drain and leave to cool. Mix up all the ingredients. I found the only way to do it was to squash them together with my hands. Cut out only the very woody ends of the leaves. 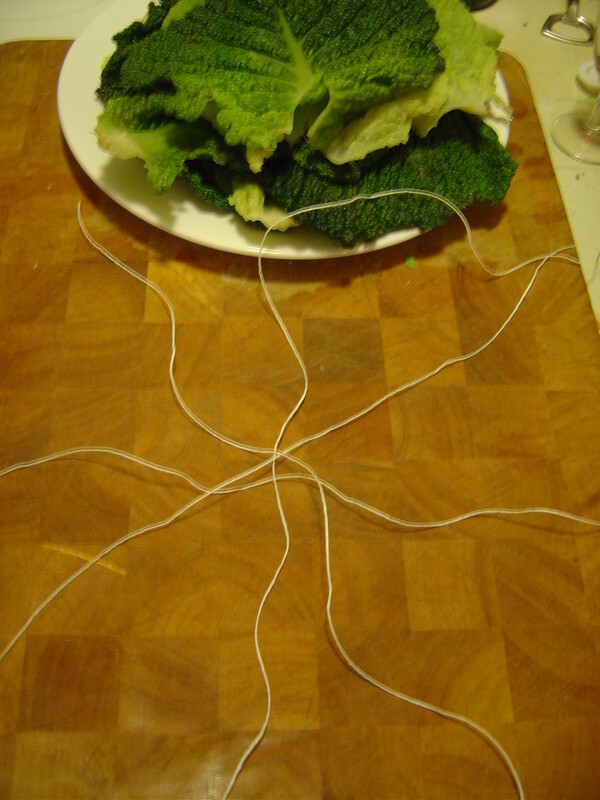 Lay out the strings as shown; I think you need four strings cut sufficiently long to pass around the finished parcel and to tie at the top. Cover with boiling water and simmer for about an hour. NOTE: Mine were delicious, but I sort of steamed them for 45 minutes or so. The local experts look as if they have been boiled for longer. You can choose! 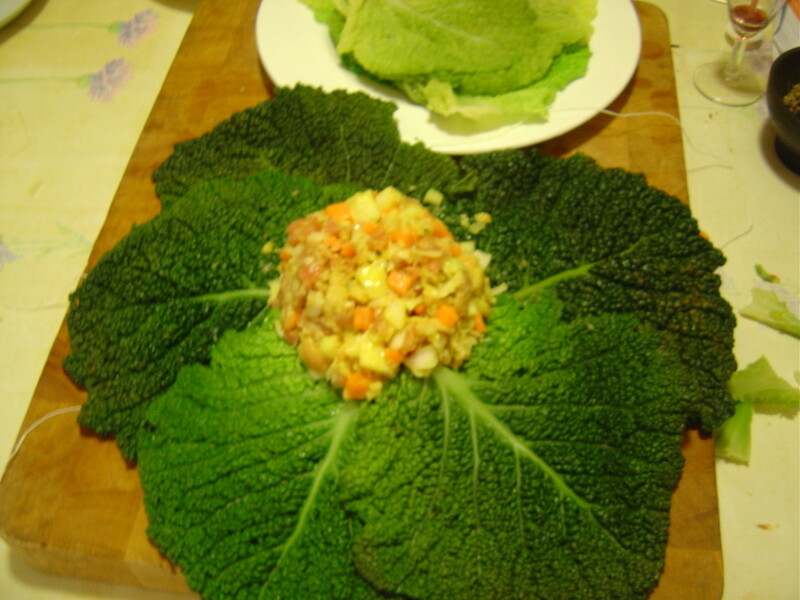 At our meals the cabbage was served as a course in its own right, after the entrée, before the main dish. 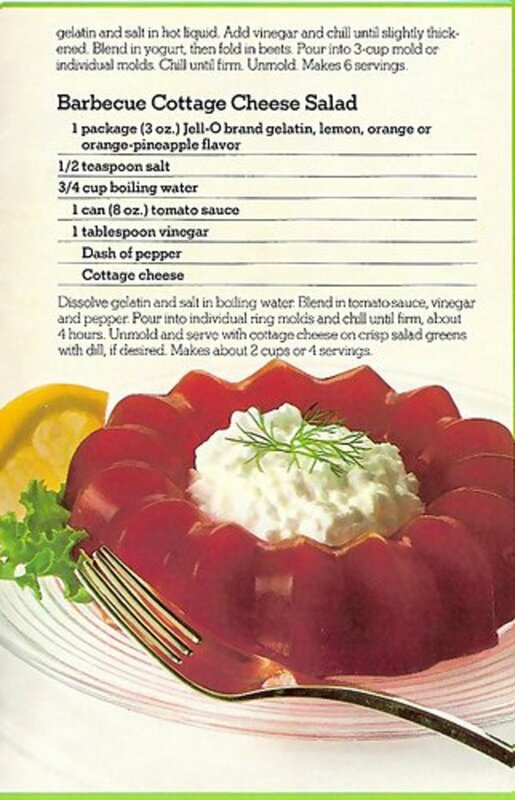 No need for sauce as it is a wonderfully moist dish. I served mine hot on the first day as the main course at dinner, along with baked potatoes, giving everyone a quarter each. 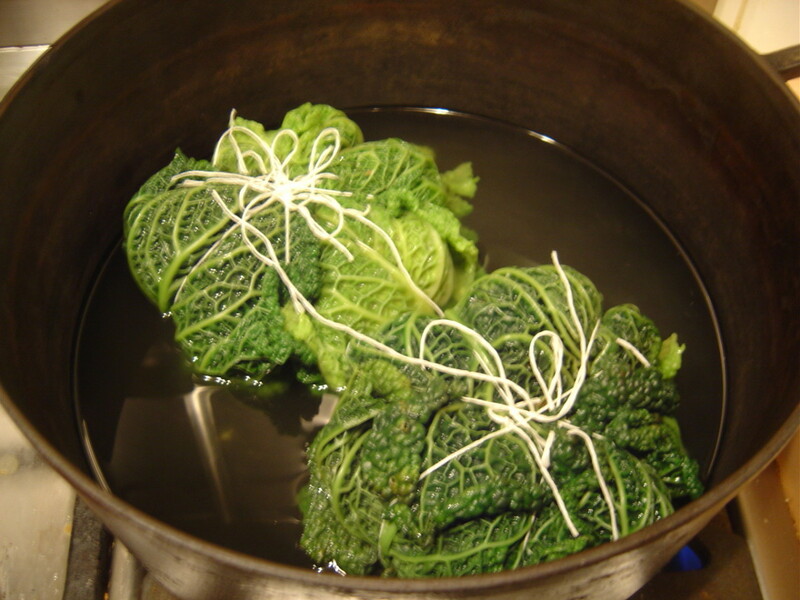 On the second day, when the cabbage parcel was cold, it was possible to slice it. Served like this with a little salad for decoration, it makes a super starter. They look so pretty on the dinner table too. I made mine later in the evening and so the photos haven't turned out very sharp. I'll have an opportunity to retake them fairly soon though as my 13 year old son wanted them again straight away! How is that for success? If you have a look at the comments below, you'll see that Amanda Severn has reminded me about adding a vegetarian alternative. She used to make a dish like this using 'Sausmix' and I think it would work really well if you replaced the meat with chestnuts. Please feel free to leave your favourite variations on a theme. 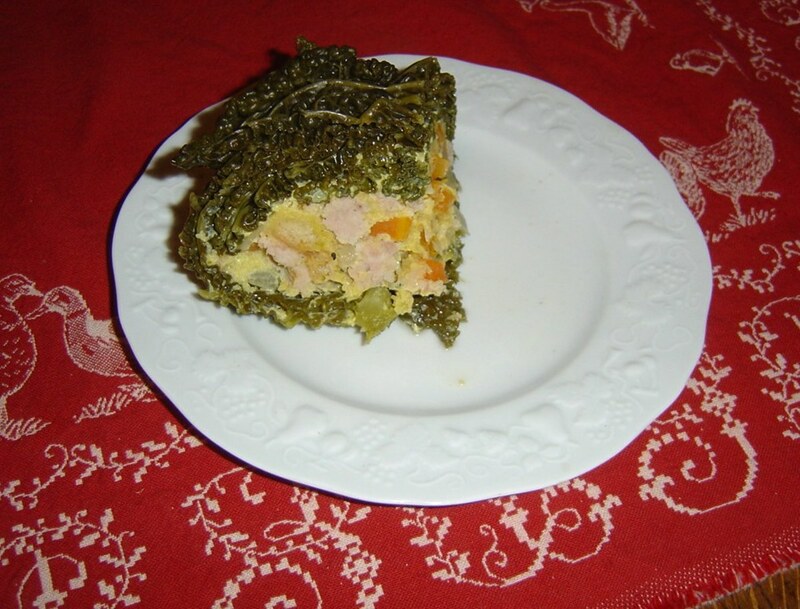 Other readers have passed on their recipes for stuffed cabbage, so I've added a section below. Do have a look. There are already some lovely ideas! If you look in the comments section below, you'll see these recipes that kind folk have added, but I thought they look so excellent, that I'm going to add them here. As soon as I've had time to cook them I'll put photos in - unless anyone can send me pictures sooner! Amanda Severn: This (recipe) particularly caught my eye, because it reminded me of a veggie version I used to make using Sosmix and a rich tomato and red wine gravy. AnnCee: I make a filling of sauteed grated carrot, minced onion and brown rice. A stick of medium cheddar goes down first, then a scoop of the rice mixture. Make the rolls and chop the remaining cabbage roughly. Lay the chopped cabbage in the casserole and then the rolls. Pour over a can or two of tomato sauce. Scatter a little grated cheese on top. This sounds so simple but somehow the flavors come together to make a delicious mild dish that everyone loves to eat. Hi, thanks for your message. Of course you can change the stuffings (though I never tired). Your idea sound wonderful. Can you come back and let me know how it went? 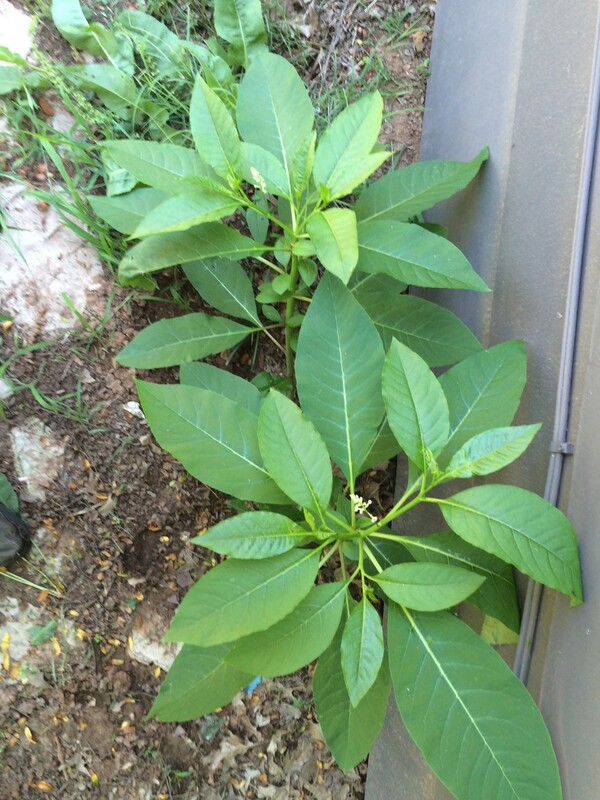 If you can send a picture and recipe I'll add it to the hub. I love cabbage, but I usually eat it raw. I'll definitely try this technique. I'm imagining a Californian version with Mexican chorizo, fresh corn, and herbs! Thanks Beth. It really is tasty, cheap and an all-round winner. Do let me know how you get on if you do try them out. crystolite, Thx so much for the feedback; pleased you enjoyed the article. katrinasui. I love cabbage too, but tend to neglect it as a vegetable. Do hope you like it. Wonderful hub. i like Cabbage. So i will try this recipe. Russell-D. Thanks so much for this recipe. I'm going to add another section to the hub and put your recipe, and Anne and Amanda's into it. If anyone has pictures, do send them. 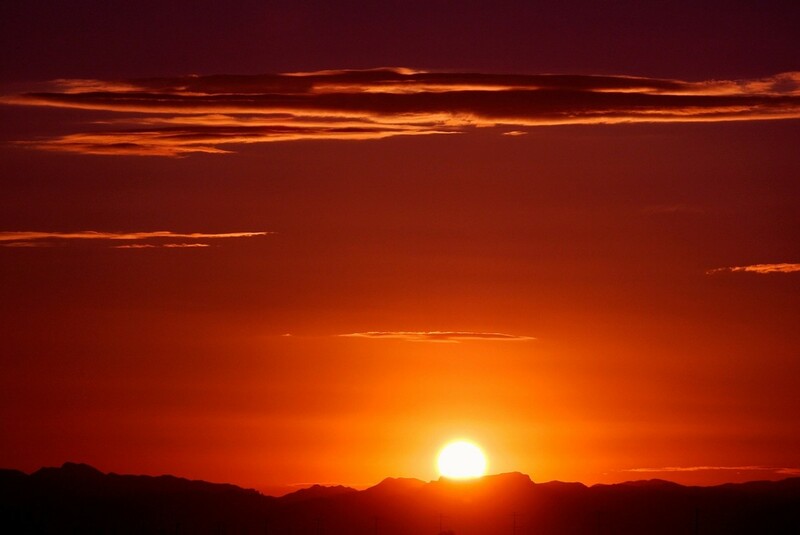 8 years ago from Southern Ca. Eiddwen, please do let me know how it goes. I hope you enjoy it. I have quite a collection of recipes bookmarked into 'My Favourite Recipes now. I will let you know how it went when I try it out. Gypsy48 and AnnCee, thanks for your kind words! Your recipe looks great AnnCee and I'm going to make it as soon as I can get another cabbage. I'll have to use white rice though, as the French are not into whole foods yet. I must remember to bring a sack of brown rice back from England! Many thanks for adding it to this hub. That's a very pretty way to do the stuffed cabbage. I make a filling of sauteed grated carrot, minced onion and brown rice. A stick of medium cheddar goes down first, then a scoop of the rice mixture. Make the rolls and chop the remaining cabbage roughly. Lay the chopped cabbage in the casserole and then the rolls. Pour over a can or two of tomato sauce. Scatter a little grated cheese on top. This sounds so simple but somehow the flavors come together to make a delicious mild dish that everyone loves to eat. I love stuffed cabbage. Great recipe! mindyjgirl, thanks for dropping by! Thanks for this, Amanda. I love to have vegetarian options for recipes and I'd forgotten about sausmix - I used to use it all the time. I expect you could also replace the meat with chestnuts and still keep it very 'Limousin'. Your recipes always look great! This one particularly caught my eye, because it reminded me of a veggie version I used to make using sausmix and a rich tomato and red wine gravy. I haven't made it in years, and you've just inspired me!